Alex Wright Interview in the WWE Tryout documentary on Pro7 Maxx!View now! High Imapct Weekend Seminar for beginners on Sa. 08-24-19 until Su. 08-25-19! Participation spots are limited!Register now! Next Step Wrestling Seminar for advanced on Sa. 16th of February 2019!Register now! Rocketbeans TV stars, Andreas and Gunnar, at my wrestling school for a training!View now! As guest at the first ever WWE Tryouts in Cologne, Germany! Met with my former student, NEW Star and now WWE NXT Star, Fabian Aichner! View pictures! Former TWS wrestling school student Fabian Aichner aka Adrian Severe is on WWE NXT TV! WWE Tryouts in Cologne on 3rd until 6th of November 2018! High Imapct Weekend Seminar for beginners on Sa. 04-13-18 until Su. 04-14-18! Participation spots are limited! Register now! Former TWS wrestling school student Fabian Aichner aka Adrian Severe was on the WWE European Tour! Summer Break - Wrestling Days om Tue. 07-31-18 until Fr. 08-03-18! Participation spots are limited! Register now! High Imapct Weekend Seminar for beginners on Sa. 03-24-18 until Su. 03-25-18! Participation spots are limited! Register now! Former TWS wrestling school student Fabian Aichner aka Adrian Severe have had a couple WWE matches now! Advanced seminar "Next Step" on Sa. 01-13-18! Get 20% discount until 12-23-17! Register now! Former TWS wrestling school student Fabian Aichner aka Adrian Severe signs a multi-year WWE contract! Beginners seminar on Sa. 08-26-17 until Su. 08-27-17! Participants spots limited! Register now! Beginners seminar successfully completed with a great group and a lot of new talents! Alex Wright as guest on the Rocket Beans TV show - Almost Daily - also in Hamburg! View now! Alex Wright as guest on the Rocket Beans TV show - The new german evening entertainment - with Lars Paulsen and Andreas Lingsch in Hamburg! View now! Business trip to cologne for the TV show Paul Panzers Comedy Game Evening as a fight instructor. Training with Ross Antony! Alex Wright - owner of the TWS wrestling school and CEO of NEW signed as the first german promotion a german TV Deal with Rocket Beans TV! View now! Alex Wright - owner of the TWS wrestling school and CEO of NEW signed a international TV Deal with FITE.TV! View now! Promotional clip and corporate video of the TWS wrestling school now online on Youtube! View now (PR clip)! Corporate video of the TWS wrestling school! View now! Just a few spots left at the Seminar for beginners on Sa. 04-08-17 until Su. 04-09-17! Register now! Seminar for beginners on Sa. 04-08-17 until Su. 04-09-17 - Register now! Former student Fabian Aichner (NEW: Adrian Severe) WWE Cruiserweight Tournament participation confirmed!Read now! 10% summer-discount on the seminar for beginners on Sa. 08-27-16 until Su. 08-28-16 - onyl until 06-19-16! TWS wrestling school is the exklusive partner of NEW, the first German Wrestling-Promotion with an international TV Deal!Read now! High Impact Weekend Seminar for beginners on Sa. 08-27-16 until Su. 08-28-16 - Register now! NEW interview with Alex Wright!Read now! High Impact Weekend Seminar for beginners on Sa. 03-12-16 until Su. 03-13-16 - Register now! Radio station Bayern 3 - Mensch! Radio interview with Alex Wright from 12-04-15!Listen now! High Impact Weekend Seminar for beginners on Sa. 03-12-16 until Su. 03-13-16 - Register now! Newspaper Nürnberger Nachrichten report about the wrestling school! Read now! High Impact Weekend Seminar for beginners on Sa. 03-12-16 until Su. 03-13-16 - Register now! Newspaper: Bild Zeitung - big report about the wrestling school - The Wright Stuff! Read now! Invitation to WWE VIP Party in Munich! High Impact Weekend Seminar for beginners on Sa. 03-28-15 until Su. 03-29-15 - Register now! Sport1.de interview: Alex Wright - his view on Tim Wiese WWE debut! Read now! High Impact Weekend Seminar for beginners on Sa. 03-28-15 until Su. 03-29-15 - Register now! 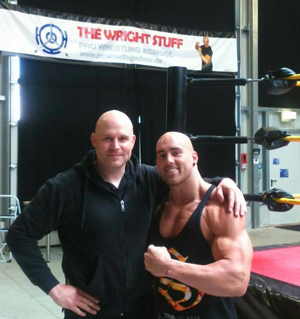 TV station Sport1 to guest at the wrestling school "The Wright Stuff" Read now! High Impact Weekend Seminar for beginners on Sa. 03-28-15 until Su. 03-29-15 - Register now! Focus Online interview: Alex Wright - his view on Tim Wiese! Read now! High Impact Weekend Seminar for beginners on Sa. 03-28-15 until Su. 03-29-15 - Register now! SPOX.com interview: Alex Wright - his view on Tim Wiese! Read now! New pictures online! High Impact Weekend Seminar for beginners on Sa. 03-28-15 until Su. 03-29-15. Register now! 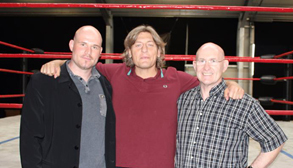 WWE wrestler William Regal visits the wrestling school! WWE interview with Alex Wright at the WWE Performance Center View now! Last Minute Offer: 25% discount on the High Impact Weekend Seminar for beginners on Sa. 04-12-2014 until incl. Su. 04-13-2014! Extension of the discount until 04-10-14! Register now! Breaking News: Alex Wright guest coach for WWE at the WWE Performance Center in the USA! After 14 days in Orlando, USA back in Germany. Was a really great time in the USA. A huge "Thank you" for the invitation from WWE. WWE NXT TV and the WWE Performance Center and of course including the talents and the coaches were just phenomenal. I have met so many old friends and got a lot of new ones. It was a great pleasure to me, to come over to the states for the WWE to the WWE Performance Center and be there as a guest trainer for the WWE talents. Here a few pictures. I can not show any pics from inside or of the talents. Thanks for understanding. Breaking News: A few days ago former "The Wright Stuff" student Adrian Severe was invited by WWE to receive another Try Out in Orlando, USA at the WWE Performance Center! WWE Try Out: Three former students of the TWS wrestling school received a WWE Try Out in Munich! Alex Wright had a radio-interview with Sport1.FM! TV station Franken Fernsehen was guest at the wrestling school - The Wright Stuff!Watch it now! Former wrestling students in the main event at a NEW show!Watch it now! Interview: TNA commentator Nic Heldt and wrestling-infos.de were guest at the N.E.W. HotSpot, which is also the home from the wrestlingschool "The Wright Stuff"!Video jetzt ansehen! Former wrestling students of "The Wright Stuff" are fighting for the biggest french wrestling promotion - wrestling stars! We are on vacation from 09-08-13 until 09-22-13! High Impact Weekend Seminar for beginners will take place on Sa. 08-31-13 until Su. 09-01-13! Register now! Sky TV was guest at the wrestling school from Alex Wright!Watch video now! Merry X-mas and a Happy New Year! 15% discount on the High Impact Weekend Seminar for beginners on Fr. 04-12-13 until Su. 04-14-13! Now for 212,00 euros only! Discount only available until 13-31-12! Register now! Special One-Day Seminar on Sa. 09-22-12: Beat the Pain - 10 hours - 149,90 Euros only! Sign up now! Former TWS Pro Wrestling School student wins NEW World Heavyweight Championship Title! TV Station Pro7 with its show Galileo was guest at the wrestling school "The Wright Stuff" at the N.E.W. HotSpot! Check it out! New Years - Special 15 percent discount on the next seminar on Fr. 02-17-12 until Su. 02-19-12 and lots more! The TWS wrestling school and Alex Wright wishes all wrestling fans and TWS students "Merry X-mas and a Happy New Year"! Christmas-Special 15 percent discount on the next seminar and lots more! TWS students celebrate the successful debut at the NEW Show! The wait is over! Moving is in full progress! On Saturday, 11-12-11 the TWS Wrestling School will hold the first trainings in the new Wrestling Gym. New Address: Im Gewerbepark 26, 91093 Heßdorf close to Erlangen, Germany. New training dates online! Hot News! TWS Wrestling School moves in a different location! The TWS Wrestling School will move to the NEW Headquarters at the end of the year. New training dates online. Here you find a little TV report on the TWS Wrestling School and Alex Wright! Check it out! New pictures and training dates are online! The next High Impact Weekend Seminar for beginners will take place on Fri. 24th of June 2011 until Su. 26th of June 2011! Register now! Nürnberger Press interviews Alex Wright! Check it out! New pictures and training dates are online! The next High Impact Weekend Seminar for beginners will take place on Fri. 24th of June 2011 until Su. 26th of June 2011! Register now! We wish everybody a Merry X-mas and a Happy New Year! The next High Impact Weekend Seminar for beginners will take place on Fri. 18th of Feb. 2011 until Su. 20th of Feb. 2011! Register now! New training dates are online! A new record is made! A student of Alex Wright does 3500 squats at once! Respect for this accomplishment! The next High Impact Weekend Seminar for beginners will take place on Fri. 18th of Feb. 2011 until Su. 20th of Feb. 2011! Register now! New training dates are online! Another High Impact Weekend Seminar with 14 participants was successfully completed! The Wrestling Press - Magazine interviews Alex Wright! Check it out! New pictures online! High Impact Weekend Seminar for beginners! Fr. 08-06-10 until Su. 08-08-10! Book now! Plus Alex Wright at spox.com! Check it out! High Impact Weekend Seminar for beginners! Fr. 08-06-10 until Su. 08-08-10! Book now! Plus Alex Wright at spox.com! Check it out! High Impact Weekend Seminar for beginners! Fr. 08-06-10 until Su. 08-08-10! Book now! Plus Alex Wright and his Wrestlingschool at Radio Energy! Check it out! New pictures online! High Impact Weekend Seminar for beginners! Fr. 04-16-10 until Su. 04-18-10! Just two spots left! Happy New Year! High Impact Weekend Seminar for beginners! Fr. 04-16-10 until Su. 04-18-10! Just a few spots left! High Impact Weekend Seminar for beginners! Fr. 04-16-10 until Su. 04-18-10! Sign up now! Students of The Wright Stuff - Pro Wrestling School made a successful debut at the NEW "High Explosive" Event! US5 boygroup superstar "Izzy" had his first wrestling training. Not only is he an exceptionally gifted singer he is also exceptionally gifted for the sport of wrestling! The HI-Seminar was completed successfully again. New pictures and training dates are online! We have a strong new partner - New European Championship Wrestling! Their banner is located here. New pictures and a new training dates are online! The Wright Stuff -Pro Wrestling School has a new partner! New pictures and a new video are online! High Impact Weekend Seminar (Beginner) - Fr. 03/27/09 to Su. 03/29/09! Send your registration form in time! New pictures and new training dates are online! A new beginners group will be starting soon! Please, send your registration in time!!! The contact and registration area is working again!!! To contact the school please use info@prowrestlingschool.de! The new training dates are online! High Impact Weekend Seminar! Group picture online! 10th of May GWP Meet and Greet with Alex Wright!!! New training videos are online! The training dates have been updated. The perfect christmas present. A gift coupon for a Pro Wrestling Training. Information per request. From friday 11/30/2007 up to and including sunday 12/02/2007 the High Impact (Basic) Weekend Seminar takes place again. A new training video and the new training dates are online! The Pro Wrestling School is now offering a summer special. You can find more information here. Alex Wright was the guest of honor at the GWP "Sign of a Champion" event in Roth, Germany. Here are some pictures of the event. "German Wrestling Promotion" has become a new partner of our site. Their banner is located here. Since today "D-Generation X" is working together with us. In the partner-area you can find a link to their site. Today the new official online presence of "The Wright Stuff" - Pro Wrestling School was launched today.